I was fortunate enough to learn so many amazing things from the guest speakers who came to share at First Unity from around the globe when I worked there. Hearing Donna Eden & David Feinstein forever changed my life. Anyone who tells me about any physical or emotional challenges they are going through, I send them to one of two places or both: Donna Eden and Young Living essential oils. More on them later. I want everyone to know about Donna and David, their work and to USE THE DAILY ENERGY ROUTINE. Daily. It’s in the title! It’s only 5 minutes, and it’s best to do it 2x a day, but start wherever and whenever! If you want a copy of this simple energy medicine daily protocol, I have them and give them to everyone. Fill out our contact form and let me know your address and I’ll drop one in the mail. Also, their relationship book is off the charts – an honest look at relationships and how to use energy medicine to understand your own, as well as your partners. If you are in a relationship or not, this book will be eye-opening to how your energy system has influenced your current and past relationships, and if you are struggling in any way it is a clear guidebook for using energy medicine to improve your relationship. Buy it: The Energies of Love: Using Energy Medicine to Keep Your Relationship Thriving. I have known Temple for quite some time now; she was my boss at First Unity Spiritual Campus and we got to know each other very well. She was always supportive of me in so many ways. As a shaman she could see my thirst for knowledge and transformation, and she has assisted me in many ways along that journey. For this I am eternally grateful. 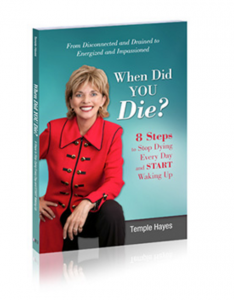 I highly recommend her latest book When Did You Die? : 8 Steps to Stop Dying Every Day and Start Waking Up. Too many people are already dead while living, and I have always so resonated with this title. It’s a book that addresses how we can choose life everyday and every moment, and it has a great cover photo by yours truly. Temple has a daily blog of inspiration, and you can listen to her on her Unity.fm every Wednesday. What an honor to work and play in life with these people!